Garmin is one of the leading brands of GPS technology, manufacturing different units for automotive, marine and outdoor activities. 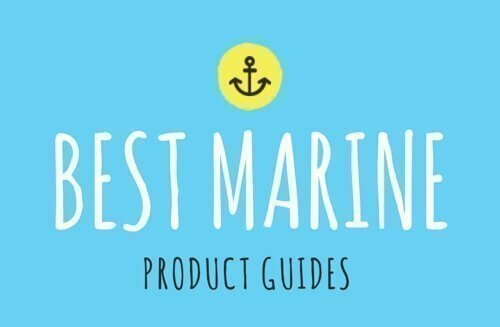 One of the first Garmin GPS devices produced was meant for marine use. This device was sold to the U.S Army and was used in the Gulf War in 1991. Today these Garmins are used for professional and novice fishermen around the world. Serving one purpose: to find fish and reel them in. They have many benefits and features placed into one user-friendly platform giving you a better chance of catching fish. With Garmin s advanced GPS technology, you have a minimal chance of getting lost and a maximum chance of bringing home your limit. There’s also less risk of losing any of the mapped-out locations you’ve previously used. A fish finder is a device used to seek and catch fish using SONAR (Sound Navigation and Ranging). It’s a form of echolocation that detects objects underwater by emitting an echo. The echo reverts back to the device to give you the position of any living creature or object. You will be able to tell the difference between an inanimate object and a living creature by the different colors it displays on the screen. The technology of the fish finder device has improved quite significantly over the years. 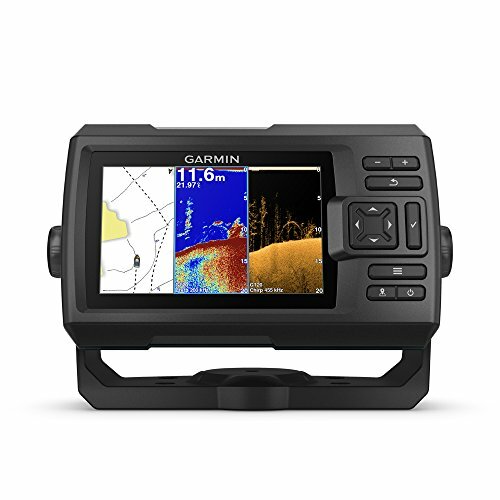 Most Garmins come with features so advanced you can measure the depth of water you’re in and even the speed with which your boat is traveling. Garmin has improved its devices over the years by now incorporating CHIRP technology into the fish finders. CHIRP is an acronym for Compressed High-Intensity Radar Pulse that gives you the ability to adjust the frequency used on your device. This is beneficial as it can give you a more accurate reading of what sort of aquatic life the signal allocates. CHIRP is much more powerful than pulse sonar. The newer version of the Striker series comes in a variety of different sizes with improved display screens and enhanced screen resolution. Three functions have been added to the Striker Plus series. On the Striker Plus, they have an added feature called a Quickdraw Contour Map. This can chart up to 2 million acres of topographical mapping information. It’s optimal for finding and saving your waypoints on to the device. Using the Quickdraw map feature you can create your own routes, display boat speed and draw up custom maps. Wi-Fi has now been added to the Striker Plus series which is available on the 7’’-9’’ models. This allows you to add applications to your device as well as receive push notification while you’re on the water. You can connect any communication device to your Garmin using Wi-Fi. Active Captain App is an application that is also part of the Striker Plus series. You can use the Wi-Fi function to connect to the app when you need to. The Active Captain allows you to update your maps and routes. You can use this application to sync new waypoints and routes. 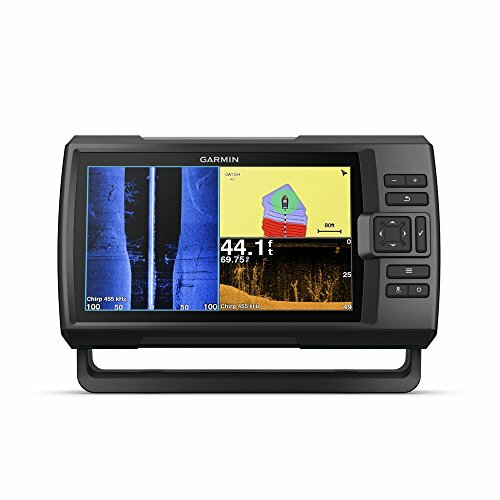 ClearVu is a scanning feature on the Garmin which is excellent for displaying fish and structures below your boat. It’s designed for offshore, freshwater and inshore fishing. The images are almost photographic, giving you more definition of what’s beneath your boat which makes it suitable for ice fishing. Much like ClearVu, the SideVu feature gives you high definition images of any lifeform located around your boat. This technology gives you the opportunity to identify the most ideal spots for fishing. SV is the acronym for SideVu which features both SideVu and ClearVu technology on the same Garmin. CV is the acronym for ClearVu and only displays ClearVu technology. With a 9’’ high definition display screen, the Striker Plus 9SV gives you crystal clear images with outstanding target separation. It has a built-in GPS that features a Quickdraw Contour map display which stores up to 2 million acres of data. The 9SV has both ClearVu and SideVu scanning technology. For optimal use, this device has a built-in Wi-Fi allowing you to connect to applications and online features. The Striker Plus 7SV comes with a 7” display screen with a definition of 800 x 480 pixels for clear image display. There is a backlit feature which is perfect for bright sunny days. This Garmin captures every angle using not only SideVu and ClearVu but DownVu as well. It displays all three images at once on your screen. The Striker Plus 7CV fish finder has ClearVu technology allowing you to scan the water directly under your boat which is also ideal for ice fishing. It has a 7” display screen and a clearer scanning sonar. This device features a keyed interface with dedicated buttons for optimal simplicity. With a rugged design, the Striker Plus 5CV fish finder is suitable for any kind of fishing expedition. The Garmin is excellent for freshwater use and it’s best suited for kayak or offshore fishing. It includes the ClearVu transducer and has a 5” display screen as well as the Quickdraw Contour map and has 2D CHIRP sonar. With added improvements, the 4CV fish finder has a much faster Quickdraw Contour map display which comes with a GPS plotter that allows you to mark up to 5000 waypoints. The Striker Plus 4CV has a slightly larger display than previous versions and has a pixel resolution of 480 x 272. Much like the 5CV fish finder, the Striker Plus 4CV is excellent for small boat and kayak fishing, which makes it excellent for both saltwater and freshwater fishing. 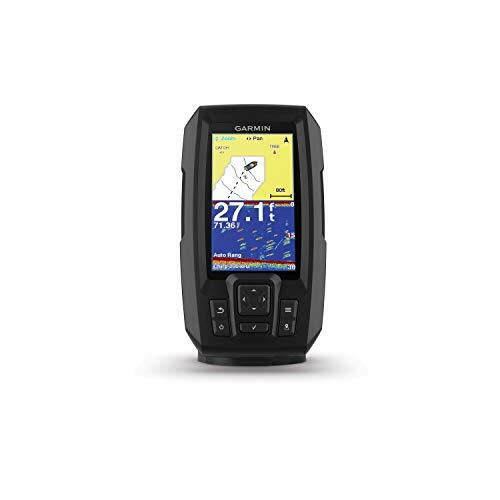 The Plus 4 fish finder is suitable to use in any weather conditions. Like most of the Striker Garmins, this device has the Quickdraw Contour Map feature which creates high definition maps of the places you’ve visited. It also has speed display and can show considerable water depth in the murkiest of waters. Final Thoughts - Which One is for You? Whether you’re a professional fisher or a novice, fish finders are easy devices to use in the water. They’re simple to understand as they have basic and user-friendly functionalities. To choose the correct fish finder, consider the type of component you’re looking for. What frequencies do you need for inland fishing or deep-water fishing? You will also need to decide on the display you prefer, especially if you live in an environment with erratic weather conditions. 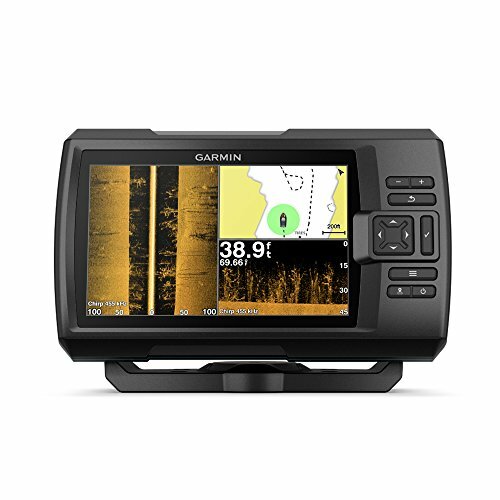 If you use fishing for leisure and you spend most of your time in a small boat on lakes, then you will only need a standard Garmin fish finder. Any device that has ClearVu would be suitable for this kind of fishing. 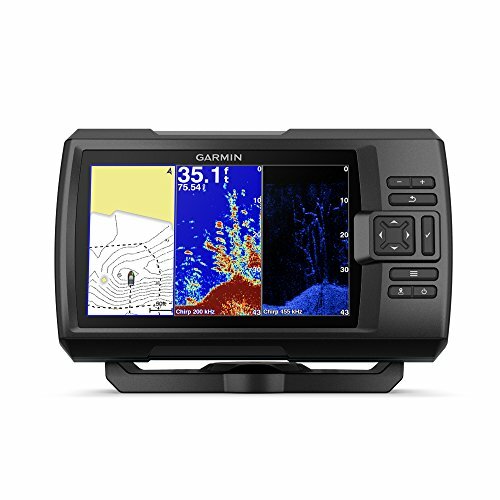 If you are more of a deep-sea fisherman, a high-end Garmin would be more suitable as you will need to know the depths and temperatures of the water. It’s advised that you get a Garmin with a network system as there would be a larger area to cover with deep sea fishing. It’s also good to take precautions, especially when you’re out at sea; because you want to be found easily in case of an emergency. Each device is designed for the finest fishing experience. Instead of sitting in your boat in frustration waiting for the fish to come to you, you can find them instead. The Striker series is excellent for finding fish in the deepest and murkiest of waters making your fishing trips a lot simpler. It’s also designed to function in any form of weather conditions. If you’ve ever wanted to try out fishing but have no idea where to start, getting a standard or even an advanced fish finder would be a good start. With all the advanced sonar technology, you’re able to excel during any kind of fishing expedition. Who knows, maybe you could even turn it into a sport and become a professional angler? That’s the power of technology!